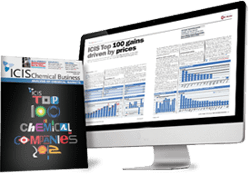 ICIS has extensive coverage of the Polypropylene markets and our network of locally-based experts deliver reliable and trustworthy pricing information on a weekly basis. 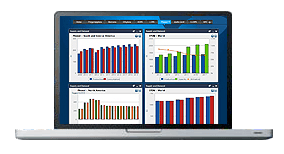 Price reports are published from Africa, Asia, southeast Asia, Middle East, China, CIS, Europe, Turkey, US and Latin America. 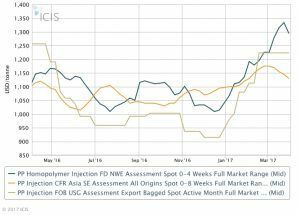 Global polypropylene (PP) supply levels will remain limited in 2019, with little in the way of new production coming online. Demand fluctuations in other countries could lead to restricted availability in Africa. Strong pull from China could see stocks directed into Asia. Stocks are low in the country and this may put pressure on buyers if African demand levels rise. PP demand may improve in the latter half of the quarter, assuming that Chinese order levels also increase following the Lunar New Year holiday period. Chinese buyers often come back from the vacation in need of materials. A spike in Chinese prices could drive a similar trend in Africa, as players have to compete for limited volumes. Polypropylene (PP) spot availability was curtailed in the first quarter, owing to both scheduled and unscheduled maintenance turnarounds in the Middle East and southeast Asia. International traders directed available volumes to other markets, including south Asia, where margins were more attractive. Some offers for Chinese-origin materials emerged in the quarter, offered to Vietnam and Indonesia, as Chinese suppliers found better margins in the export market amid declining domestic prices. A weak basket of regional currencies against the US dollar weighed on demand in the first half of Q1 2019. Buyers held onto low PP resin inventories, with most unwilling to build stocks amid bearish sentiment brought about by the US-China trade spat. The downstream finished goods market in Indonesia and Thailand was sluggish due to general elections taking place late in the quarter. In Vietnam, buying momentum was similarly slow. Europe polypropylene (PP) supply has been sufficient in the first quarter, but not oversupplied, in spite of the length in upstream propylene towards the end of the quarter. Imports have not been available in particularly strong supply, and have been limited mainly to producers with assets in Europe. PP supply and demand have been fairly balanced, with buyers not rushing to buy, but sellers not rushing to sell. Contractual demand may have been supported by prebuying ahead of the planned cracker maintenance programme, and UK demand has been boosted by buyers building stock ahead of Brexit. PP supply in the Middle East in Q1 is set to increase from Q4 2018 levels as two out of the three producer units who faced outages have resumed normal operations. This, coupled with the seasonal lull during the Lunar New Year in China is likely to dampen prices across regions including the Middle East. Weaker Chinese demand during the holiday may also prompt Middle Eastern sellers to allocate more volumes to other regions. Demand is likely to strengthen in Q1, as regional processors look to re-stock inventories early in the year. However, the extent to which demand strengthens could be offset by any volatility in crude, and also the introduction of the value added tax (VAT) in Bahrain, as buyers may delay or curb purchases while adjusting to the workflows and paperwork surrounding the new tax regime. Supply levels are likely to deteriorate at the beginning of 2019. There is little in the way of new production and ready materials have been exhausted, as players currently prefer them to fresh imports. An increase in prices in another competing region may see allocations re-directed there, due to poor nature of Turkish demand. Demand levels are not expected to show any significant increase in the first quarter, although there is hope that the economy should recover to some extent this year, it is expected to be a slow process. Limited availability may force spikes of demand but there is no appetite to buy anything beyond basic requirements. US PP supply improved in the first quarter amid lengthening monomer supplies and expanded capacity. US producers added capacity through 2018 through debottlenecking, resulting in improved production rates. Ample monomer availability also encouraged higher operating rates at PP plants. Propylene inventories as measured by the Energy Information Administration (EIA) rose to record highs in the first quarter. Some unexpected issues at PP plants which had limited supply in 2018 were largely resolved by the first quarter. PP demand was marginally higher in the first quarter, although demand did not rise as quickly as some had anticipated as prices tumbled after reaching multi-year highs in the third quarter of 2018. Import displacement added to domestic demand as imports became less competitive, while increasing export volumes also helped sellers place additional volumes. A slowdown in the automotive sector, a major consumer of PP, limited demand growth. We offer the following regional Polypropylene analysis and news coverage to keep you informed of factors and developments affecting prices in the Polypropylene marketplace. 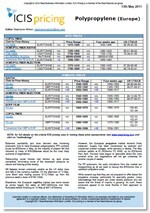 This document is intended to provide methodology support for customers receiving the ICIS Weekly Margin – PP Asia report. Polypropylene (PP) is a colourless, translucent to transparent solid with a glossy surface. It has good resistance to acids, alkalis, inorganic chemicals and organic chemicals with the exception of hydrocarbons and chlorinated compounds. It has improved impact strength, a higher softening point, lower density, better stress cracking and more scratch resistance than other polyolefins. However, a disadvantage of this polymer is its brittleness at low temperatures. Polypropylene was first produced in a slurry process using Ziegler-Natta catalysts. Bulk phase technologies were then developed while higher activity catalysts enabled gas phase processes to be used. A combination of bulk phase tubular and gas phase reactors has become a popular process. PP has key applications in packaging, fibres and automotive parts. PP can be extruded for pipe, conduit, wire and cable, while atactic PP has outlets in paper laminating, sealants and adhesives.